James River Batteau Festival – Page 2 – 34th ANNUAL – JUNE 15-22, 2019. 34th ANNUAL – JUNE 15-22, 2019. Even though the working batteau is no longer used, historians and river enthusiasts still keep the memory alive. Batteau crews have hand built replicas of the 18th & early 19th century flat wooden cargo vessels once used to haul tobacco to travel on an 8 day journey from Lynchburg, VA to Maiden’s Landing in Powhatan, VA. 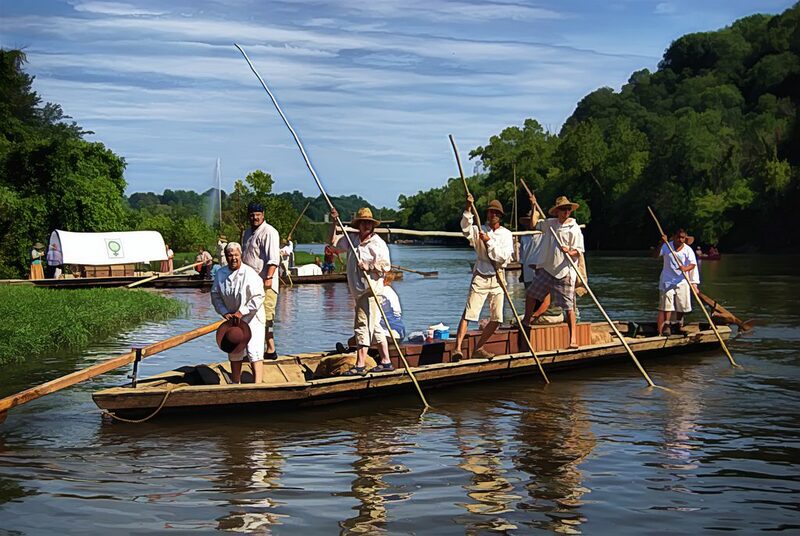 Since 1985, the James River Batteau Festival, an annual event sponsored by the Virginia Canal & Navigations Society has had as many as 25 boats and their crews travel the 120 river mile (200 km) distance each year. This event has also become very popular for kayakers and canoeists who enjoy floating along amongst the batteaus on their voyage. Annual Fall Float and Meeting of the James River Batteau Festival. Howardsville, VA, October 20th, 2018. © 2019 James River Batteau Festival	| WordPress Theme: Croccante by CrestaProject.